The athletes representing the Breen Track Club celebrating following their big win in NYC. 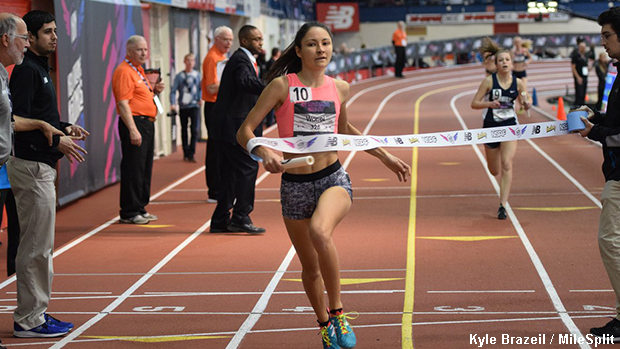 Breen's 4 x 1 Mile relay team made their trip to New Balance Nationals Indoor a successful one, as they recorded an impressive time of 20:31.47 on route to securing the race win. 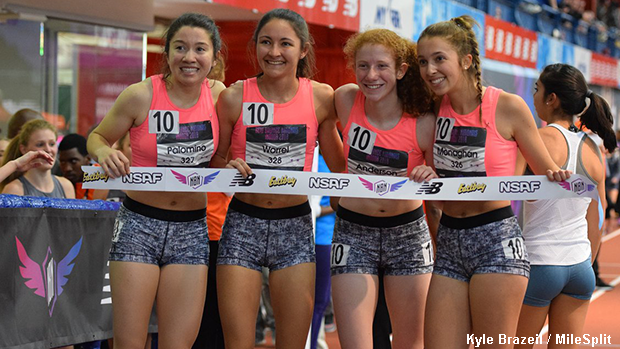 The squad from Troy, which is made up of Hannah Palomino, Megan Worrel, Paige Anderson and Meghan Monaghan, outlasted a pair of Ohio teams to earn the National Championship. Following Breen in the standings were the Granville Aces (20:33.25) and the Hilliard Davidson Track Club (20:39.66). "This is a great group of girls that fight for each other. They are athletes that anyone would be lucky to coach. They have fun, but don't take themselves too seriously. However, when it's time to go to work - they are tenacious!" Troy senior, Megan Worrel ran a strong anchor leg to seal the win for Breen.